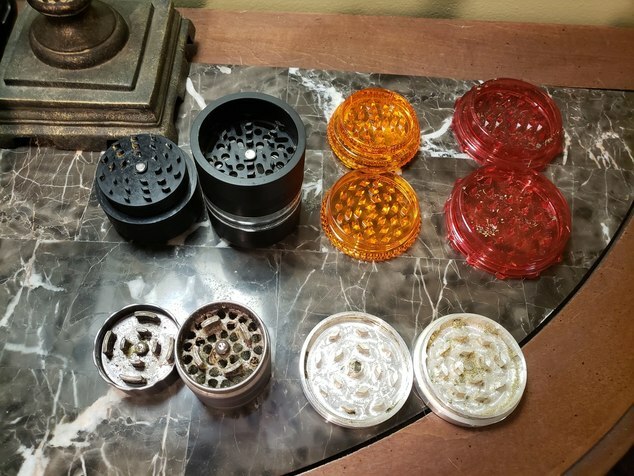 What grinders do you use the most? 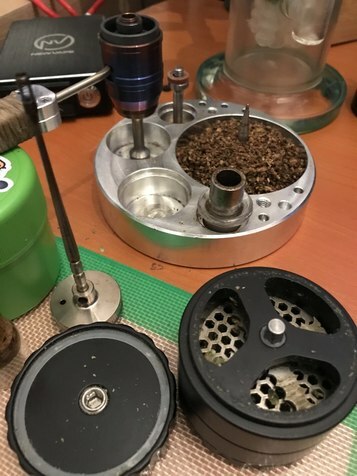 I'm wondering what grinders you use the most? I will show you my top five grinders. 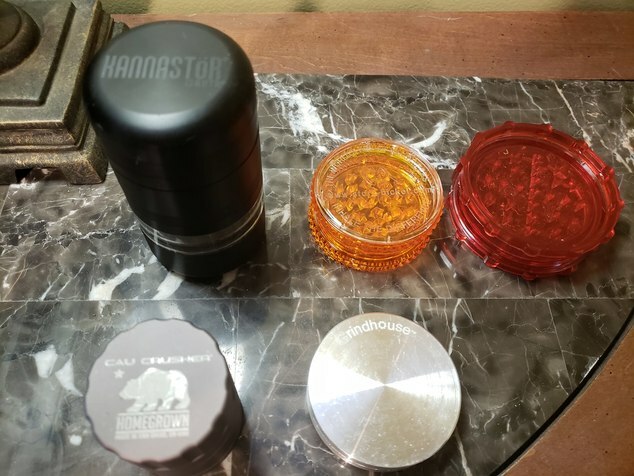 Shown are the kannastor gr8tr v2 which I use on medium ( the fine grind is almost like dust) next is the s@b grinder, then planet of the vapes free grinder, cali crusher homegrown, and the grindhouse. If I had to pick just two it would be the gr8tr and the cali crusher. They have held up nicely, are easy to clean and the grind works nicely in my vapes. When it comes to shredding Yogi always used his SLX 2.0. I actually forgot I had my S&B and a free grinder (about on par with S&B). I’ve never used them though. I went decades not knowing how good it is to own a grinder! I've been on the fence about the space case grinder and the slx grinder. I am not sure about that non stick actually making a difference. I only use one, my Lift. With a grinder this high of quality, I need no others. And after paying such a high price, I can't afford any others either. The nonstick is real. My grinder still looks new with occasional brushing off with my S&B brush. The threads at the bottom were starting to feel scratchy. I put a tiny bit of chapstick on it and it’s better than new. thank you, that's great to know. I use NV Fine Grinder only...it just works for all my vapes. I do wish I had the new wider version with the grip band on the outside.....I have a bit of an issue with my left arm (repaired distal bicep tendon...just don't work like it used to...and just lately I have wished for a bit more gripping area. But I love this grinder, it will last a lifetime, and I like the grind consistency. Just this one and on occasion the NV fine grinder. Gave my SCS, TI space case and plastic grinders away to my combustion friends. The lift is stupid expensive but it’s stainless steel, basically needs no cleaning and grinds everything you throw at it consistently. I didn’t want to be one of the ones recommending it when I bought it because I didn’t believe the marketing hype but it’s my DD now so may as well rave about it. I'm another Lift fan and like others I gave my old grinders to friends. I can understand having a couple of grinders maybe for different strains or a fine one for conduction vapes but I'm more than happy with just the Lift right now. SLX it’s all I got and as far as I can see all I need? How high of a price are we talking here for your lift grinder? 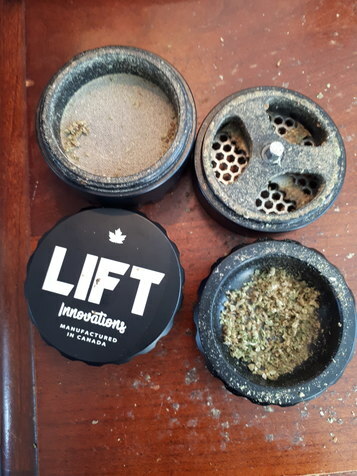 on amazon the lift grinder is $150 us so it is on the high side of grinder pricing. 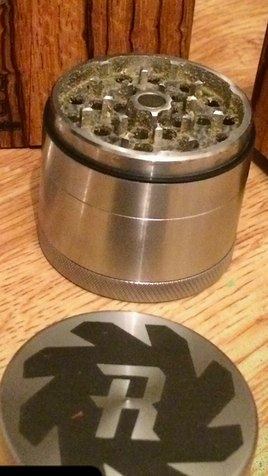 the high end grinders tend to cut rather than shred the herb. I find this actually has a positive effect on the high. If I had to guess as to why I'd say it leaves more of the flower intact. This alone makes a high end grinder worth it plus the build quality and not breaking any teeth of the grinder. The grind also is more uniform. Prices have gone up quite a bit since I bought mine. 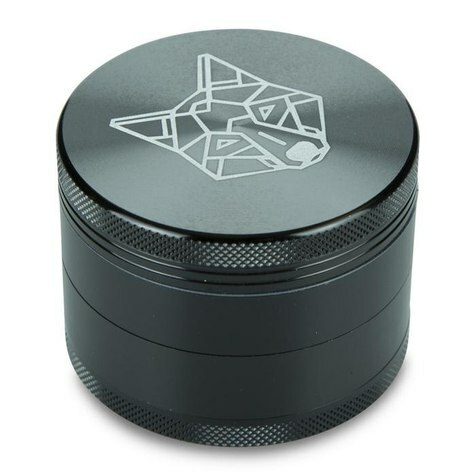 sometimes it's possible to find quality grinders at a decent price. I’m really really enjoying using the Ripper man! I’ve fallen out with it twice over the teeth clogging up slightly as there’s no coating on the Steel, but it cleans very easily with just hot water and it’s brand new again, I’m not used to washing my grinder, But it’s not a bad idea to have a Clean Grinder I suppose. I went back to my space case once also but that lasted one grind because I instantly knew I preferred the Ripper as it has a finer grind and better feel in hand. Does the fine grind work well with the mv1? just twist less? being able to put your grinder in a dishwasher is nice as it's far less steps than other ways to clean. I bought a cheap toothbrush to clean mine and it works just not as easy. I twist just the same. Works great in an MV1, IME. I prefer a quick iso bath, rinse and dry. I can thoroughly clean and dry my Lift in under 5 minutes. And it will look brand new afterward. Taking it apart for cleaning is big for me too. I don't want any moisture stuck in any nooks and crannies. I'm really loving my Ripper for my MV1's...solid and consistent grind that does it for me. Yes it gets a little "sticky" with moist herb but I blame that on my not drying it long enough after storing in a jar with 62% Boveda packs. But with a little hot water and a firm toothbrush, it's easy to clean in less that 2 minutes. I let it drip dry for a few minutes and then hit it with a blow dryer if I'm in a hurry. I also picked up a Chewy 2.0 Cheech and Chong Edition for my social session vape (Xmax Starry POV) to replace the POV grinder that came with the Starry. It's really a cool conversation piece the Chewy, and it actually grinds to a med/fine grind the Starry works well with. 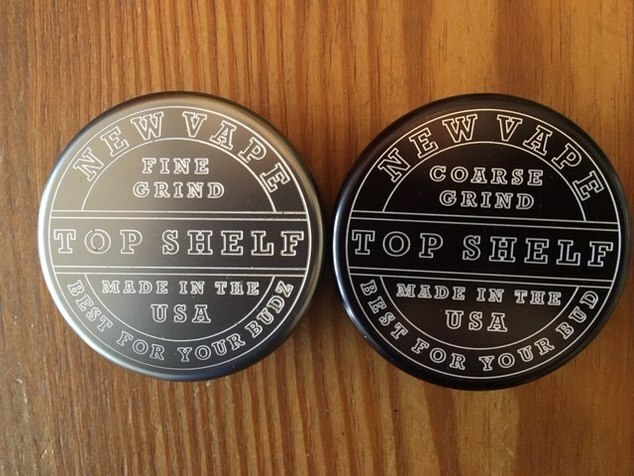 @Baron23 I'm a big fan of the NV fine grinder, too. I've always had my eye on the Coarse Grinder as well but not many people seem to have it. 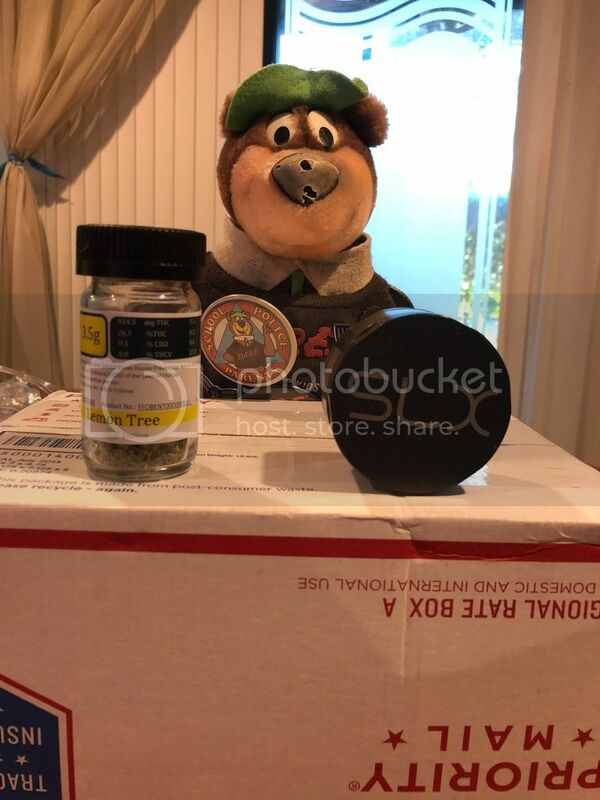 Do you have pics of a grind from it? I'm wondering how even and chunky it really is. Would be great in a Nano I would think. The wolf looks likes a good deal! Grinding takes some potency. If you use a grinder a few times, there is stuff there that stuff could have been in a bowl. I am pretty sure it's unpopular but I will grab a bud put in the oven smash it up good while it was in the oven. I like even. but uneven has higher highs and low's like an adventure. I’ve tried grinding slowly to try and stop the weed getting stuck due to the teeth being uncoated and have an inward curve but thankfully the weed seems to drop through after another grind. I’ve suggested diamond teeth or coating to eliminate this issue so time will tell.